Once again Peter Heath has written an extraordinarily complex and nuanced account of Europe in the first millennium AD, a period when the modern foundations of European society were established. He focuses on migration and its role in transforming the Mediterranean-centered world of Late Antiquity into the Atlantic-centered one of the Medieval and Modern eras. Toward that end, the author looks at the drift of Germanic tribes ever westward into the Roman Empire (to c. AD 600); their replacement by Slavs in north and central Europe (after AD 400); and the last great migrations of the Vikings (AD 700-1000). Up to the 1960s, the theory – influenced by 19th Century ideas of nationalism and, frankly, racism – of mass migrations of large, coherent “nations” of peoples sweeping through the old provinces of Rome and exterminating or pushing all before them dominated the historiography. As textual and archaeological evidence accumulated, this view grew more and more inadequate. It engendered a reactive scholarship that emphasized internal transformations on both sides of the frontier rather than migrations as critical factors (Preface and Chapter 1, “Migrants and Barbarians”). Walter Goffart is a good (and intimidating) example of this school. 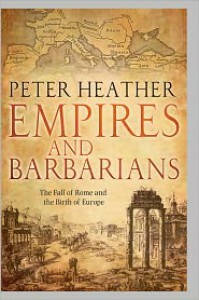 * Heather argues that neither extreme is terribly productive in explaining what happened, and we should take a more nuanced view that incorporates the very real internal transformations that made Constantine’s empire very different from Augustus’ and Fritigern’s Germania very different from Arminius’ and the external migrations of significant populations that certainly took place (p. x). In his zeal to restore the good name of “mass migration,” Heather may himself stray into the pitfall of overemphasis but not too often and not too deep. A reader hoping to understand or find out about the anti-migration argument will be disappointed but I’d refer you to Heather’s earlier book, The Fall of the Roman Empire: A New History of Rome and the Barbarians, or (better since it’s from a proponent) Goffart’s work. ** That aside, Heather’s argument for restoring a balance in our perceptions of a nascent European culture is valid, and the evidence he martials for his case, impressive. And eye-opening. Heather has a particular facility in evoking the society of late Antiquity and making the reader see events through the eyes of the participants. Heather begins the book by looking at the difference between the social and economic development of “Germania” from our first glimpse of it in Roman literature (primarily Cornelius Tacitus) to the Frankish hegemony of the 8th Century (including the Anglo-Saxon conquest of Celto-Roman Britain) (here the primary text is Ammianus Marcellinus). He then looks at the Slavicization of north and central Europe in the wake of the Germanic migration. And he rounds off his survey by examining the Viking migrations that crowned the last few centuries of the first millennium AD. The basic argument for all of these developments is this: Migration is motivated by negative factors such as war and political turmoil but also by positive factors such as economic opportunity. People look toward wealthier economies for the promise of a better life. In the face of a strong polity like Rome before c. 400, a four-tier zone developed: (i) Rome proper, relative to others a highly developed, mature, wealthy economy; (ii) an inner periphery of barbarian polities intimately tied to Rome in trade and politics; (iii) an outer, less developed periphery; (iv) a zone with little or no direct contact with even the inner periphery much less Rome where the levels of technological, political and economic development remained at an Iron Age level (or less). A paradox of this development is that in pursuing its own economic interests, the more advanced culture sows the seeds of relative (if not absolute) decline. In the face of Roman aggression and manipulation, the barbarians on the Empire’s frontier developed more complex and richer economies and equally complex and more powerful political organizations. In 9, Arminius led a coalition of tribes that annihilated three Roman legions (c. 18,000 men) yet within a decade punitive campaigns had thoroughly pacified the frontier and at no time was the Rhine border or the provinces behind it seriously threatened. The situation was different 150 years later when Marcus Aurelius faced the well organized alliance of the Marcomanni in a devastating 10-year war. And the tipping point had been reached by 378 when Tervingi and Greuthungi Goths annihilated another Roman army at Adrianople. At that time, the frontier was fatally breached and the Empire was never able to completely regain its dominant position. A similar paradigm governed all the migratory movements of the first millennium. There are differences in detail, of course. For example, in the case of the Anglo-Saxon conquest of Britain, elite replacement was a more influential factor than in the Gothic and Frankish conquests of Gaul. Historical accident plays a role and you can’t hitch your star to any single (or simplistic) explanation for outcomes. Migration played an enormous role in the development of Europe but that role diminished over the course of time as other developments came to the fore. By the end of the millennium, Europe from the Atlantic to the Urals was sufficiently advanced socially, economically and politically that subsequent migrations such as the Magyars and the Mongols were the assimilated rather than the assimilators. 1. As mentioned in another review, Heather’s authorial tone is – at times – too folksy and colloquial. I’ve complained before in other reviews, and I’ll continue to do so, but this is not acceptable for a serious book of this nature. I’ll continue to read future works by Heather but I’ll hope (probably in vain) that the tone will be closer to his earlier books. 3. And my crowning complaint: At many points in the narrative, Heather refers to photographs and there’s a “picture acknowledgements” page but nowhere is there a section of photographs. Nowhere! This is beyond inexcusable. That quality control failed so spectacularly in this print run of the book leaves me spluttering in indignation. I can’t convey how frustrated I feel…argh! Maybe the paperback edition will correct these mistakes. If you’re interested in reading this book, I’d wait for it. * Full Disclosure: I respect and admire Goffart and, in the face of his erudition, it’s hard for the dilettante historian such as myself to resist his arguments but I think Heather’s point about ignoring the role of migration is valid. ** Goffart is not as user-friendly for the general reader as Heather but any serious, even if amateur, student of the period needs to read his work (see my review of [b:Barbarian Tides: The Migration Age and the Later Roman Empire|9149839|Barbarian Tides The Migration Age and the Later Roman Empire (The Middle Ages Series)|Walter Goffart|http://ecx.images-amazon.com/images/I/51mRHOErObL._SL75_.jpg|14028746] here).